Arsia Rozegar (right), author, and Professors Pardis Minuchehr (center) and Maziar Valamotamed (left). Arsia Rozegar lectures on “The Shahnameh in Pop Culture and Media" during the Persian Cultural Week. Arsia Rozegar presenting his research on “The Shahnameh in Pop Culture and Media." Dr. Pardis Minuchehr and Lukas Anderson opening remarks at the Nowruz Celebration Night. Master Kazem Davoudian performs traditional Persian music on Santour during the Nowruz Celebration Night, March 25th 2016. Over 100 GW and non-GW guests attend the Nowruz Celebration Night on March 25, 2016! 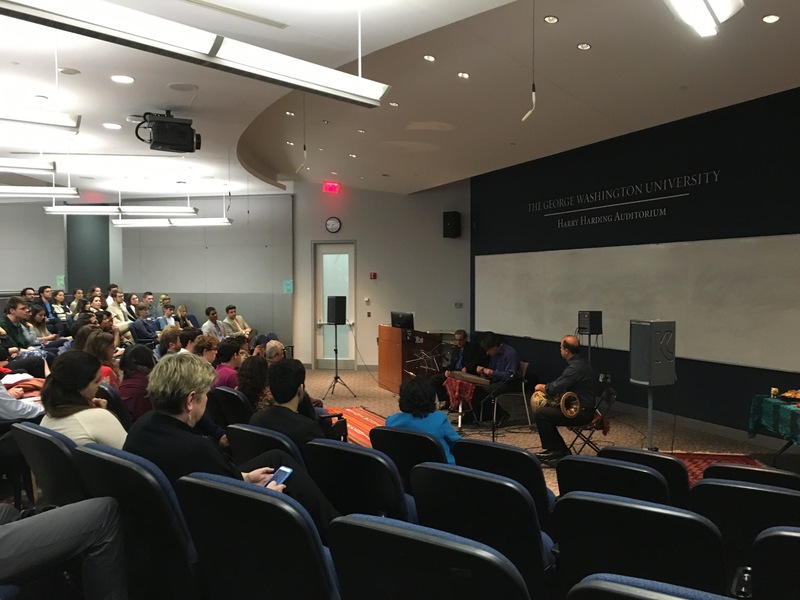 Master Kazem Davoudian (left) on Santour and colleague on the Tombak perform traditional Persian music during the Nowruz Celebration Night, March 25th 2016. Nakisa Azizi, GW graduate student, presents poetry in Persian. Professor Pardis Minuchehr introduces the best student prizes on April 26, 2016. 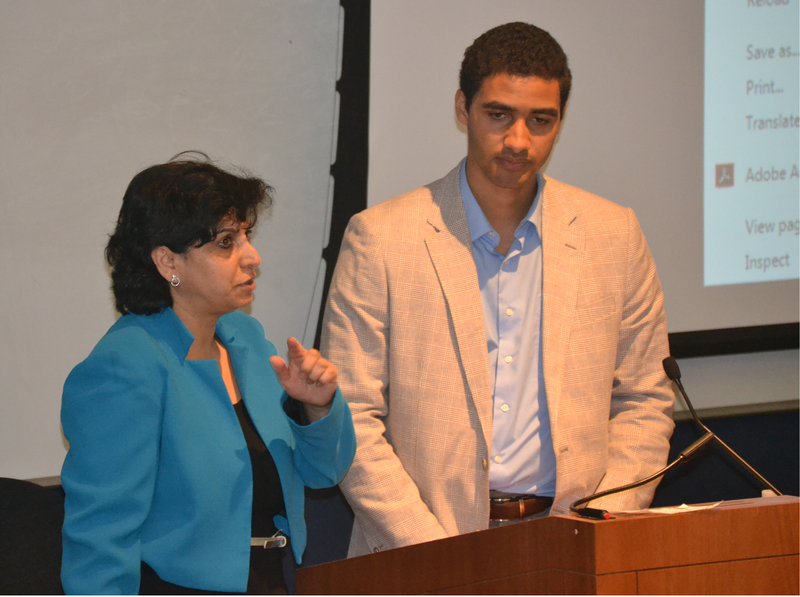 Professor Pardis Minuchehr introduces Dr. Mahvash Shahegh, previous president of the Iranian American Cultural Society of Maryland on April 26, 2016. 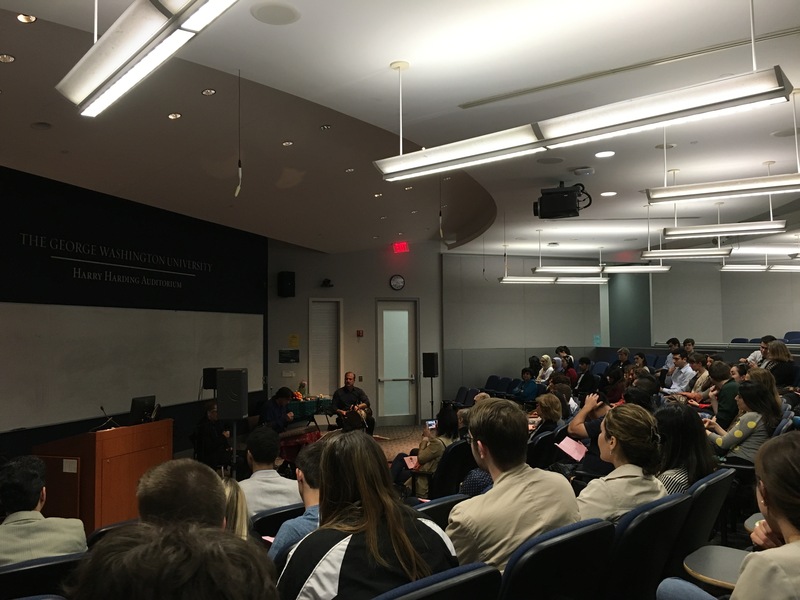 Amanda Steinberg, Middle East librarian at Gelman, speaks about the latest Persian Mahdavi-Damghani collection at GW's Global Resource Center. From left to right, Amanda Steinberg, Dr. Mahvash Shahegh, recipient Pasha Abrishamchian, and Dr. Pardis Minuchehr. Pasha receives the advanced level best student prize and first Jahangiri Scholarship award to a GW student. Dr. Mahvash Shahegh (left) and Dr. Pardis Minuchehr (right) award Emily Salwen (center) a Jahangiri Scholarship Award. Emily Salwen receives the intermediate level best student prize and the first Jahangiri Scholarship award to a GW student. Dr. Mahvash Shahegh (left) and Dr. Pardis Minuchehr (right) award Jack Skopolowski (center) a Jahangiri Scholarship Award. Jack Skopolowski receives the beginner level best student prize and the first Jahangiri Scholarship award to a GW student.